Refinancing your FHA loan may offer you a little financial relief by taking one or more payment burdens off your shoulders. 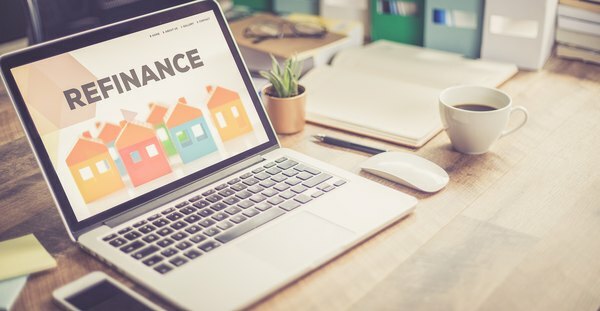 Depending on your refinance goals, the type of FHA refinance and your successful qualifying for the refinance, you may be able to lower your monthly mortgage payments, lower your interest rate or shorten the term of your mortgage. And you may even be able to receive cash back from your refinance, which you can apply toward education costs or debt consolidation. The Federal Housing Administration (FHA) doesn’t actually lend the money for mortgages. The money comes from FHA-approved lenders, and the FHA’s role in the transaction is to guarantee the mortgage for your lender by requiring certain types of mortgage insurance from you. And aside from not lending money for mortgages, the FHA likewise doesn’t refinance mortgages. When you refinance your existing mortgage, the parameters of the original mortgage change. Your credit score may have improved since you qualified for your mortgage, which may net you a better interest rate; your income may be higher, or market interest rates may have come down. Or there may be other variables that influence your getting a better deal on a refinanced mortgage. A refinance restructures your mortgage so the interest rate, monthly payments and term of the loan change. A newly refinanced mortgage, for example, may result in lower monthly payments because of a lower interest rate. Or you may decide to keep paying the same monthly amount you're paying now but at a lower interest rate, which shortens the time left before your mortgage is fully paid. Interest rates vary for FHA refinances, and they can also change on a daily basis, depending on the market. Your specific interest rate is calculated with a number of variables in mind such as your credit score, the lender and the mortgage term. For example, over a one-week period in March 2019, average FHA refinance rates for a 30-year fixed-rate mortgage increased from 3.91 percent to 3.98 percent, according to Bankrate.com. As you pay down your current mortgage, you’ll begin to see some fruits of your investment in the form of equity. Simply put, equity represents the difference in the current market value of your home minus the amount you owe on your mortgage. Unless you live in an area where property values have become devalued, your home is likely worth more now than when you purchased it. Refinancing your FHA mortgage includes numerous options, which are divided into cash-out refinances and no-cash-out refinances. Called a no-cash-out refi for short, this type of refinance means that you’re refinancing your home for the balance you owe on your mortgage. But in a cash-out refi, you’ll refinance for more than the balance you owe, receiving the difference in cash. You can use this cash to eliminate other debts, to fund home improvements or to pay for education costs. Many homeowners elect to receive cash back from their FHA refinance to put their hard-earned equity to work. Neither your lender nor the FHA puts restrictions on what you choose to do with the cash you receive after refinancing, but many homeowners choose to re-invest this money into their home. By remodeling, making repairs or beefing up the landscape design for your home, you’ll increase its value and ultimately realize an even greater return on your investment. Based on a current appraisal, you’ll need to have a minimum of 15 percent equity in your home to qualify for an FHA cash-out refi. If you pass this hurdle, you’ll also need a credit score of not less than 580, and you must have a good mortgage payment history for the past 12 months. Your lender will also look at your debt-to-income (DTI) ratio, which compares your monthly debt to your monthly income. For 2019, up to 31 percent of your income can be allocated to your housing-related debt, and up to 43 percent of your income can go toward your monthly expenses and other debts. Although some types of FHA refinances require you to have your home appraised as part of the qualifying process, an FHA streamline refi is considered "streamlined" because it typically doesn’t require an appraisal. The goal of an FHA streamline refi is to lower the interest rate on your existing mortgage. This type of refinance also reduces the paperwork required from your lender, compared to other types of FHA refinances. Other than not having to provide an appraisal to qualify for this type of FHA refi, other qualifying guidelines are also streamlined. You’ll simply need to have held your existing mortgage for at least 210 days, and you'll need to have a minimum of six monthly payments under your belt before applying for an FHA streamline refi. You’ll also need to prove how receiving an FHA streamline refi provides value. Although some types of FHA refis are available to homeowners with existing conventional loans that are not backed by the FHA, the FHA streamline refi is only available to homeowners who have existing FHA mortgages. As its name implies, an FHA simple refi is pretty straightforward. Although you can’t get cash back from an FHA simple refi, some lenders allow you to include closing costs as well as certain pre-paid expenses into the loan. Loan restrictions depend on state law, the specific lender and a property appraisal. Each lender requires a certain set of qualifications to determine your eligibility for the FHA simple refi. You’ll need to qualify based on your income, credit score and assets. If you qualify, you’ll move from your existing FHA mortgage to another FHA mortgage, regardless of whether it’s at a fixed rate or adjustable rate. If your home is older, it may show signs of wear and tear. You may have purchased an older home in need of rehabilitation or your home may have naturally slipped into a state of needing some repairs. The FHA 203(k) rehabilitation loan may meet your needs. This is a mortgage that allows you to make necessary renovations to your home with part of the refinance proceeds. Your home must be at least one year old, and its rehabilitation cost must be at least $5,000. The property value must meet FHA’s mortgage limit for the area where you live. The FHA allows a property value as the lesser of: the total of your home’s value before rehabilitation plus the rehabilitation costs or 110 percent of your home’s appraised value after the rehabilitation. You can use the funds from an FHA 203(k) rehabilitation refinance for certain expenses, including making your home disabled-accessible, modernizing appliances, replacing plumbing, installing a septic system, replacing your roof and even improving your landscape. Visit HUD.gov and perform a search for “FHA mortgage limits.” Follow the prompts to find these limits for the area where you live. You can search by state, county or metropolitan statistical area.